LECTURERS: Dr. Clara Han of Johns Hopkins University and Dr. Andrew Brandel of Harvard University. Together, they are collaborating on a book that will explore how families inherit the catastrophic loss of a world through war, genocide, and displacement. In this event, they discussed these issues through the lens of their own familial histories – the Korean War and the Holocaust. They explored how the familial memory of violence is inherited by future generations, with particular attention to scenes of domestic life, and they also reflected on the nature of collaboration between individuals who bear different, but related, histories of loss and displacement, and whose biographies are marked by immigration, inequality, and racialization. LECTURERS: Dr. Irmgard Bischofberger of the MIT Fluids Lab, Dr. Matthew Kleban of the NYU Physics Department (Dir. Center for Cosmology and Particle Physics), and Ché Pérez, architect and poet. NOTES: This special event brought together the fields of fluid dynamics, cosmology, and oceanography in an exploration of wave phenomena from all corners of the universe. Dr. Paola Rizzoli presented lectures on the "Venice problem", with implications of climate change, the human and ecological impact, and the nature of the sea. This event was produced in support of Green Cambridge and their carbon-offsetting programs. This event was generously supported in part by The Council for the Arts at MIT. NOTES: Dr. Bischofberger presented her work on the growth patterns of fluids - the fractal and crystalline patterns that govern the behavior of liquids, and the larger implications of these formations throughout nature. Her talks were be interwoven with projections and music for piano, saxophone, and electronics. 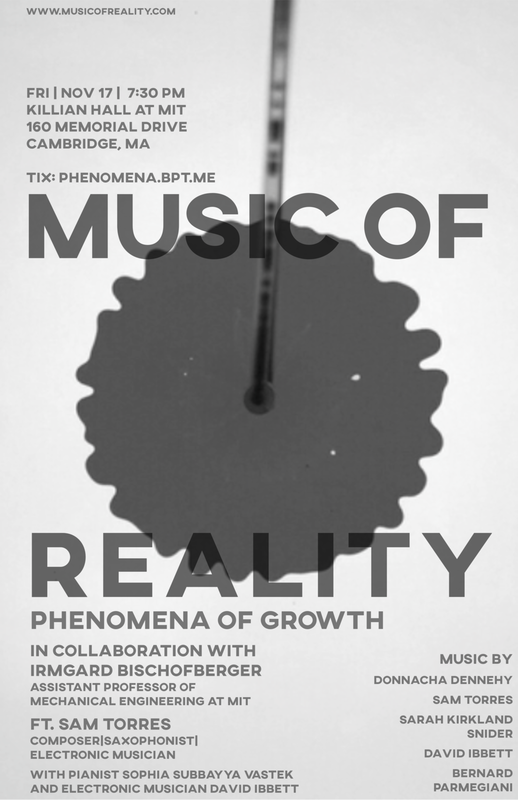 This event explored the beautiful questions in cosmology through music and lecture, as well as celebrated the release of Music of Reality's debut EP ‘Beauty from Nothing’. Cosmologist Dr. Cora Dvorkin of Harvard presented talks that explored the big, open questions: studying the cosmic microwave background to uncover the physics of inflation, dark matter, and primordial gravitational waves. The talks were interwoven with performances by acoustic and electronic musicians - each inspired by different questions and exploring different implications for our place in the universe. Preceding the event, there was a pre-concert discussion on the intersections of the arts and sciences with Dr. Dvorkin and Robert Kirzinger of the Boston Symphony Orchestra. Miniatures by Emily Koh, Sam Torres, Clifton Ingram, Curtis K. Hughes, and Giovanni Piacentini. Paul Garrity – “The Evolution of Sensation"
In collaboration with biologist and researcher Paul Garrity of Brandeis University, this multi-disciplinary concert showcased Garrity's research into the molecular mechanics of sensation, and its global implications, surrounded by music that delved into the themes of sense, mechanization, and impulse. The miniatures by Emily Koh, Sam Torres, Clifton Ingram, Curtis K. Hughes, and Giovanni Piacentini were written in direct response to a sonification that Paul Garrity made in his lab of a neuron firing in a fruit fly. These works are part of our ongoing mission of commissioning new music that is in direct dialogue with our collaborating scientist, in the hope that new ideas will emerge from this interpretative act. Talk - Matthew Kleban: "Pure Noise: Discoveries from the Cosmic Microwave Background"
Prof. Matthew Kleban - "Pure Noise: Discoveries from the Cosmic Microwave Background"
The inaugural NoiseGate Festival was a collaboration between The United Nations Sustainable Development Solutions Network (UN-SDSN) Global Arts Initiative, Citygram, Harvestworks, Monthly Music Hackathon, Music of Reality, Kadenze, ThinkCoffee, University of Redlands. This program is rooted in our relationship with the physical world. Man-made noise, as with any other kind of pollution, masks parts of our world and renders it different from before. As a word in our cultural language, noise is often associated with “non-music” and the ugly, but noise is everywhere on this earth, and is part of its sheer beauty, when one listens. It is easy to forget that both human noise and earth noise have arisen through the same logical progression of the universe. Humans are not separate from the earth, just as the earth is not separate from the universe, and vice versa. We have arrived at this point in time together, and though we have progressed to a point where listening intently to our physical world is an almost archaic act, our earth is still one of beauty. A deep and quiet reverence towards it can still be found in all corners of the globe. The Cosmic Microwave Background is the most perfect noise source ever observed in nature, and exists as a faint microwave signal observable by radio telescope. Professor Matthew Kleban will present a talk on some of the incredible discoveries that have come from analyzing this signal. It is our strongest evidence for the big bang, and may hide traces of dark energy, multiple universes, and cosmic bubble collisions. Our earliest origins are still a source of mystery and endless fascination for scientists and laymen alike. Equally mysterious is that somewhere along the way came beauty. Pairing a talk on cosmic bubble collisions in the early universe with theoretical physicist Matthew Kleban and music about scientific and cultural evolution, we explored these ideas of beauty, discovery, and our natural world. Professor Matthew Kleban "Cosmic Bubble Collisions"